Imagemapper 2 is a free application that creates interactive HTML Imagemaps for Web pages. Imagemapper 2 enables you to draw, modify, and set properties for 'hotspots' that are on the imagemap image.It can make both Client-side and Server-side imagemaps. It supports both CERN and NCSA server-side imagemaps. It enables also to test the imagemap in your favorite browser.It has a capability of unlimited Undo-Redo steps. ...... All image types for imagemaps (.JPG , .GIF, and .PNG) are supported.Lastly, it has a wizard that helps you to create new imagemaps. Free Imagemapper (a.k.a. 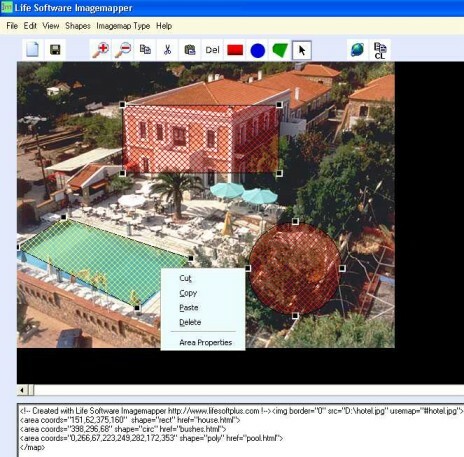 Life Software Imagemapper 2) is a freeware application that creates interactive HTML Imagemaps for Web pages. Imagemapper 2 enables you to draw, modify, and set properties for 'hotspots' that are on the imagemap image. Free Imagemapper can make both Client-side and Server-side imagemaps. Free Imagemapper supports both CERN and NCSA server-side imagemaps. Free Imagemapper enables also to test the imagemap in your favorite browser.It has a capability of unlimited Undo-Redo steps. Moreover, you can load imagemaps from already created Web pages. All image types for imagemaps (.JPG , .GIF, and .PNG) are supported. Lastly, it has a wizard that helps you to create new imagemaps. Trellian Image Mapper is a useful utility for HTML images creating. Qweas is providing links to Free Imagemapper 2.5 as a courtesy, and makes no representations regarding Free Imagemapper or any other applications or any information related thereto. Any questions, complaints or claims regarding this application Free Imagemapper 2.5 must be directed to the appropriate software vendor. You may click the publisher link of Free Imagemapper on the top of this page to get more details about the vendor.